Dolphin Pro is a free and open source Content Mangement System (CMS) built for developing highly advanced and featured social networking websites. It has a complete set of features needed for a beautiful social networking site like forums, photos, video, music, blogs, polls, events, groups, chat, messenger, templates, languages and many more. We can develop awesome social networking, dating, community website and many more. Simply, we can build our own new social site like facebook, twitter, etc with all the necessary features out of the box. Dolphin is often known as the world's top social networking CMS so far. It has many beautiful theme, templates and more over has a super clean and elegant web interface and design. 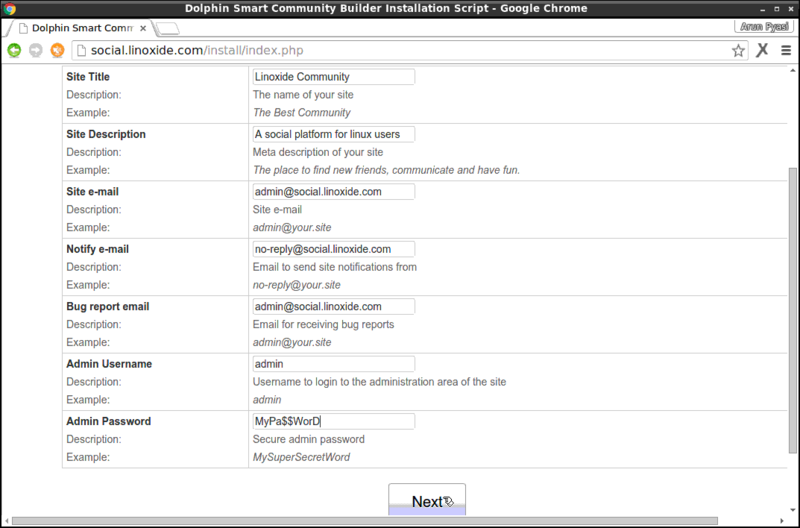 Here are some easy steps on how we can setup Dolphin Pro and build our own Social Networking site in a Linux machine. First of all, we'll gonna install LAMP Stack, LAMP is the combination of Apache Web Server, MySQL/MariaDB Database server and PHP modules. To setup it, we'll need to run the following command as shown below. While installing the lamp stack, it will pop a screen as shown bellow to configure our mariadb server and will ask us to enter a new password for the root user of database server. We'll enter the root password we wanna assign and then continue for the installation. This root password should be noted which we'll need to configure the database for dolphin. As some of dolphin’s features requires media streaming capabilities, we'll need to setup Java and ImageMagick in our machine. To do so, we'll need to execute the following command with respect to our distribution of linux. If we want enable our Dolphin application to send emails, then we'll need to setup an MTA. The most popular MTA (Mail Transfer Agent) in linux is Postfix. We'll need to install postfix and configure it. 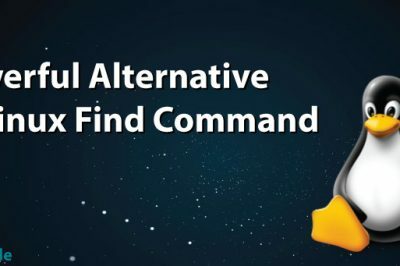 We can install postfix in ubuntu by running the following apt command. We can install postfix in CentOS by running the following yum command. In Fedora 22, we can install it using dnf package manager. After installing, we'll need to edit the configuration of our postfix configuration using a text editor. Then, we'll need to replace the value of myhostname parameter to our FQDN ie social.linoxide.com . Next, we’ll gonna start our newly installed apache web server and mariadb database server in our linux box. To do so, we'll need to execute the following commands. 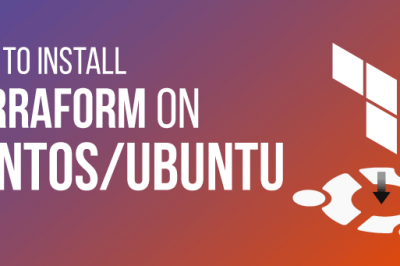 In Ubuntu, both mariadb and apache servers are set to start automatically in every system boot by default. So, we'll no need to configure it for that. Both CentOS 7 and Fedora 22 runs systemd as the default init system, we'll run the following command to start our httpd and mariadb services. Next, we'll enable them to start automatically in every startup of init system using the following command. As we have already assigned a root password for our mariadb database server in Ubuntu, we'll simply skip this step for Ubuntu. But as we haven't assigned it for our CentOS and Fedora, if we are running CentOS or Fedora, we'll need to follow this step in order to configure it. Now, as we are starting MariaDB for the first time and no password has been assigned for MariaDB so, we’ll first need to configure a root password for it. Then, we’ll gonna create a new database so that it can store data for our Dolphin Pro installation. Once we have assigned password to our root user of database server, we'll start creating our new database for Dolphin Pro. 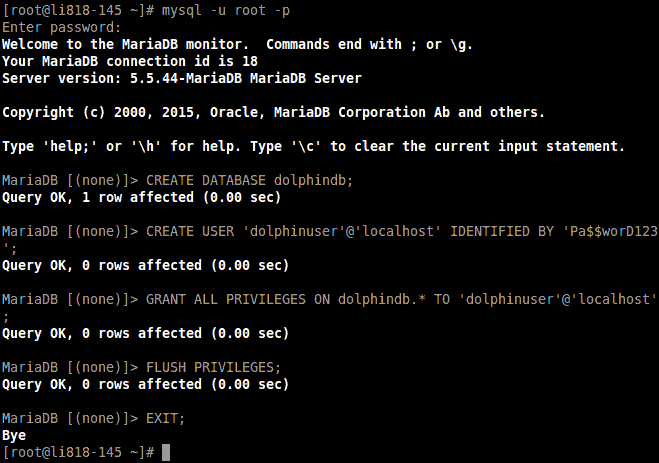 To do so, first we'll need to login to our MariaDB console by running the following command. After executing the above command, it will ask us to enter the password for our root which we had just defined in the above step. Then, we'll be welcomed into the MariaDB console in which we'll create our new database, database user and assign its password and permissions to create, remove and edit the tables and data stored in it. Once everything above is done as expected, we’ve successfully created a database named dolphindb with username dolphinuser and password as Pa$$worD123 . 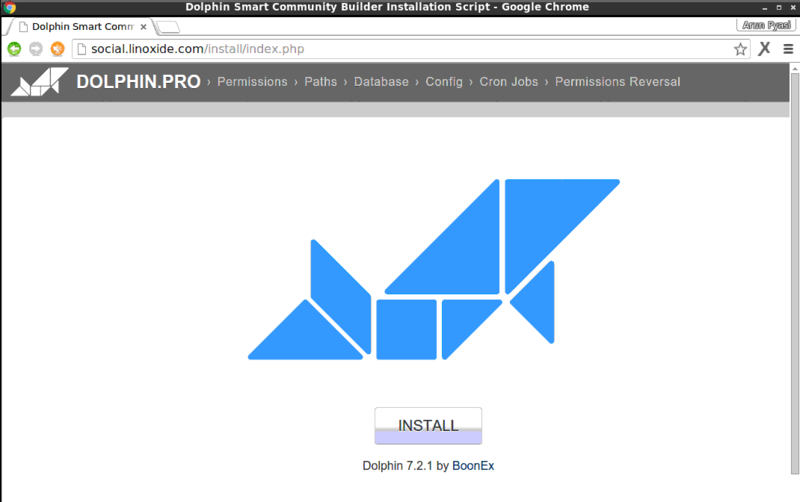 We'll now download the latest release of Dolphin Pro from their Official SourceForge.net page ie http://sourceforge.net/projects/boonex-dolphin/ . As the latest release of Dolphin Pro while writing this article was version 7.2.1, we'll gonna download it via curl and then extract it under the Apache Webroot. After its extracted, we'll run the following unzip command to extract it and then we'll move it to the default apache webroot directory ie /var/www/html/ . Next, we'll gonna configure our Apache Server so that dolphin will run with proper configuration. To do so, we'll create a new virtualhost by creating a new conf file named dolphinpro.conf . 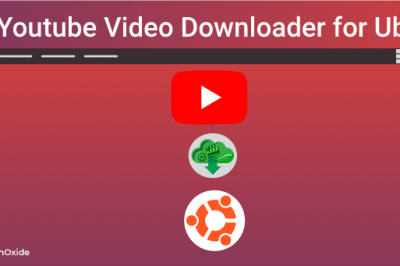 The directory here may differ from one distribution to another, here is how we create in the following distributions of linux. Now, we'll gonna add the following lines of configuration into this file using our favorite text editor. After done, we'll gonna save the file and exit our text editor. Then, we'll restart our Apache Web server. In CentOS and Fedora, we'll directly create the file dolphin.conf under /etc/httpd/conf.d/ directory using our favorite text editor. Then, we'll gonna add the following lines of configuration into the file. Once done, we'll simply save the file and exit the editor. And then, we'll gonna restart our apache web server. 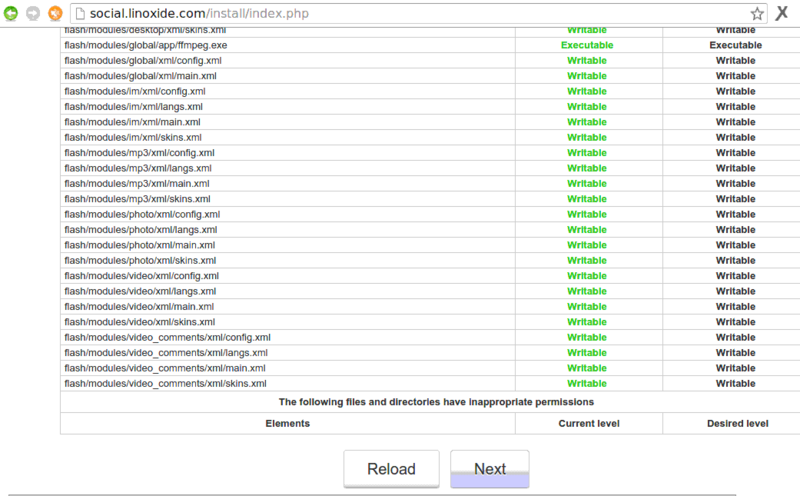 We'll now configure our PHP configuration file so that it will fulfill the requirements of Dolphin Pro. Configuring PHP as required for Dolphin will result in the best performance it can give. To configure PHP, we'll need to edit the php.ini file in our linux machine whose path differs from distribution to distribution. 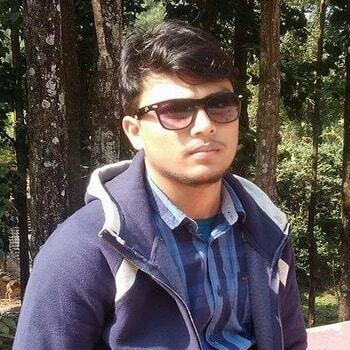 Php.ini file is located under /etc/php5/apache2/ directory in Ubuntu distributions. So, we'll need to run the following command to edit php.ini with our favorite text editor. It is located under /etc directory in CentOS and Fedora distributions. So, we'll run the following command to edit it. After the file is opened using a text editor, we'll need to append the file with the following configurations. Now, we'll gonna fix some file permissions and ownership of the dolphin's installation path. First, we'll gonna set the ownership of the dolphin's installation directory to Apache process owner so that apache web server will have full access of the files and directories to edit, create and delete. Then, we'll need to change the permission of some directories and files as follows. Now, we'll gonna configure our firewall programs to allow port 80 (http) so that our apache web server running Dolphin Pro will be accessible from other machines in the network across the default http port ie 80. Iptables is a popular firewall program which is installed in the ubuntu distributions by default. To expose port 80, we'll need to run the following commands in a terminal or console. As CentOS 7 has systemd installed by default, it contains firewalld running as firewall program. In order to open the port 80 (http service) on firewalld, we'll need to execute the following commands. Finally, after everything is setup and configured in above steps, we'll now go for accessing the web installation process of Dolphin Pro. To do so, we'll need to point our web browser to http://ip-address/ or http://domain.com . 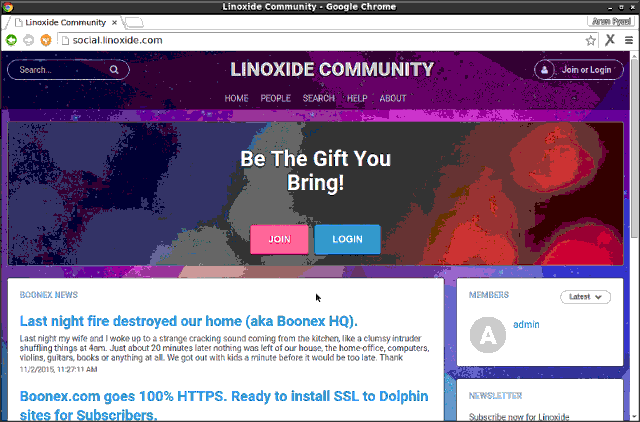 Here, in this tutorial, we'll point our browser to http://social.linoxide.com/ . 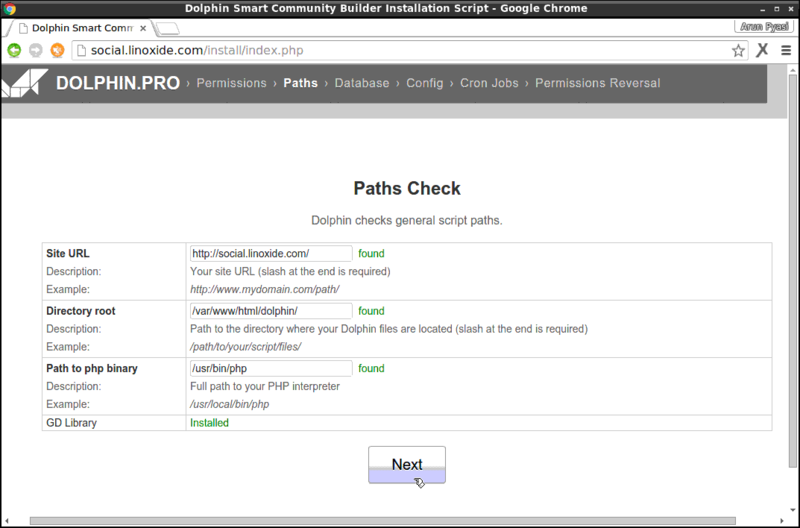 After done, we'll be welcomed by the Dolphin Pro Installation Page as shown below. Now, we'll gonna click on INSTALL button and get started towards the installation of Dolphin. After that, we'll navigated to next page which shows if all the files and directories have all the required permissions or not. As we have already set the permissions and ownership in the above step, we'll see everything correct with all the things in green color. Then, we'll click on Next button to continue. We can see that Dolphin checks general script paths and as we have already completed those required things, we'll see everything green in color. Then, we'll go further by clicking on Next. Now here is the main part of the installation where we'll set the database information so that Dolphin will be able to have full control over its database. We'll keep host port number and socket path blank so that they will pick the default configurations. We'll need to set the database name, database user and password that we had set while creating our new database. 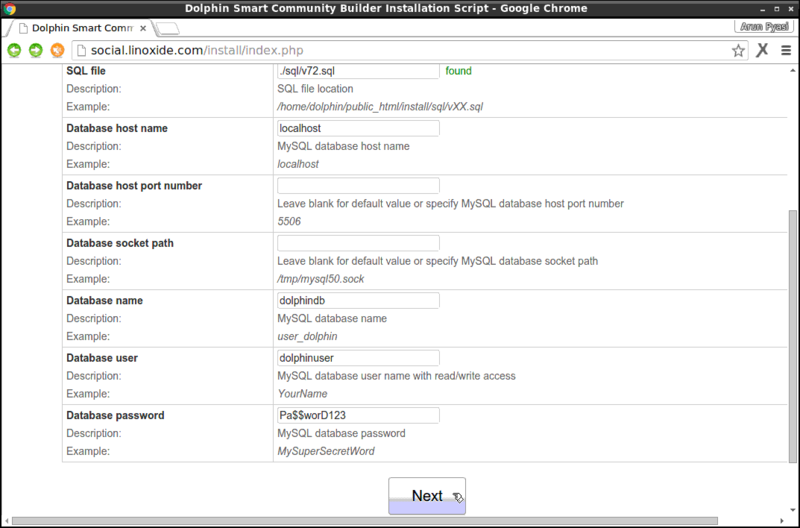 Here, in this article, we have set dolphindb, dolphinuser and Pa$$worD123 as the database name, user and password respectively. After done, we'll click Next and go further towards the Site Configuration page where we'll set the information of our Social networking site. Now, we'll need to add a new cron job which will run the script in every minute by running the following command in our linux machine. We'll need to add the following lines into the opened text editor. After done, we'll need to set Non-writable permission to the inc directory as we can seen above. And it can be done by running the following command. Finally, as everything is setup and ready to go, we'll now need to complete a post installation task. We'll now need to remove the install directory for security measures. That can be done by executing the following command. Now, we'll be able to login to the Dashboard by logging in using username and password that we had just assigned in the above step. Next, we'll first need to add all those modules needed for our social networking site. And the default homepage of our social networking site will look as below. Dolphin powers more than 300,000 web communities, online dating sites and social networking sites. 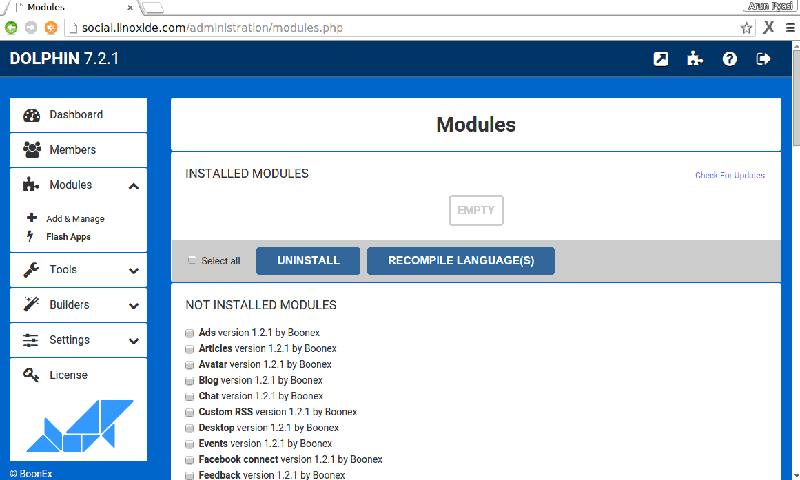 It is highly extensible with its thousands of extensions, integrations, templates and language packs available at BoonEx Market. There are native open-source iOS and Android apps that we can customise as well as re-brand on our desire for our social networking website. This CMS fulfills the dream of many non technical people to run their own social networking website. If you have any questions, suggestions, feedback please write them in the comment box below so that we can improve or update our contents. Thank you !